Iowa has an array of resorts, hotels, lodges, and bed & breakfasts. Frequent visitors to Lake Okoboji in the state’s northwest corner will recognize a few resorts on this list. On the other side of the state, Dubuque, Iowa is home to terrific resorts and B&Bs. Accommodations range from high energy casinos to quiet lakeside cottages, and from luxurious resorts to rustic cabins. 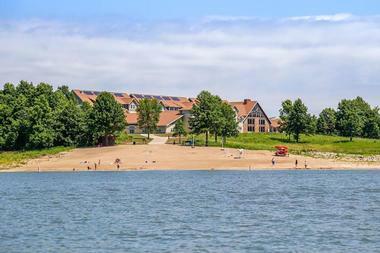 Crescent Beach Resort is a premier lakefront resort on beautiful West Lake Okoboji, one of only three spring-fed, blue-water lakes in the world. This modern resort offers guests several choices of accommodations. Two-room suites that sleep four, condos that sleep six, cottages that sleep 12, and the Grand Lodge that sleeps 14. Room amenities include separate bedrooms with en-suites, sofa sleepers, kitchens and dining areas, separate HVAC units, TVs and daily maid service. Families will love the private sand beach with gradual incline into the lake making it the perfect place for children to play and swim. Resort accommodations include fishing docks, a tennis court, yard games, water trampoline, kayaks, paddle boats, and paddle boards, Island Playground and Mini-golf, and continental breakfast – all complimentary. Eagle Ridge Resort & Spa is in Illinois’s secluded Galena Territory in the far northwest corner of the state. 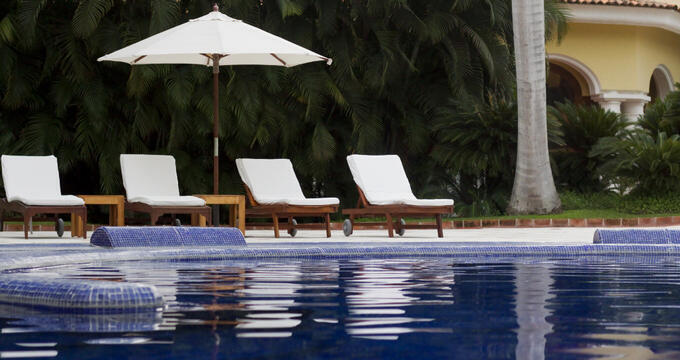 Situated on 6,800 acres, this luxury resort has 80 recently renovated rooms and suites, along with more than 200 homes and villas. Resort amenities abound with 63 holes of golf on four courses, four clubhouses with pro shops and 19th hole pubs, tennis courts, state-of-the-art fitness center, luxury spa, indoor pool, a fully stocked modern-rustic general store, and a fashion boutique. Main Lodge and Courtyard room amenities include Beautyrest pillow-top mattresses with posh bedding, plush robes, in-room coffee station, high-speed Wi-Fi, 37-inch flat-screen TV, refrigerator, and in-room dining. Hotel Julien Dubuque is a sophisticated boutique hotel in the Old Main District of Dubuque, Iowa. This elegant hotel has 133 lavish guestrooms where no detail has been spared. 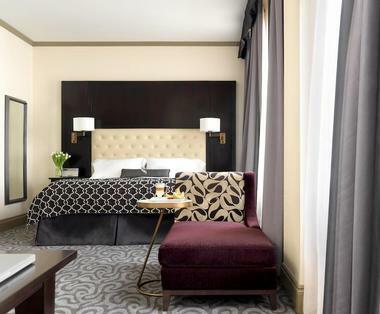 Rooms and suites range from stylish executive rooms to the other-worldly Capone Suite with an ‘Old Hollywood’ ambience. All rooms have impressive amenities that include pillow-top mattress, luxurious linens, flat-screen TVs, free Wi-Fi, refrigerator, coffeemaker, iPod docking station, spacious work station, walk-in shower, plush bathrobes, and signature spa products. Drink and dessert vouchers, complimentary morning coffee, and free parking are also included. Resort amenities include a full-service spa, indoor pool and hot tub, fitness center, Caroline’s Restaurant, and Riverboat Lounge. Located in south-central Iowa, Honey Creek Resort is situated near the shoreline of popular Rathbun Lake in Honey Creek State Park. This lake resort has everything necessary for a fun vacation, including an indoor waterpark, an 18-hole championship golf course, and a spectacular lake for jet skiing, swimming, cruising, and kayaking. Guests can stay in the stylish 105-room lodge, in one of 28 luxury cottages, or at a lakeside RV campsite. Rathbun Lakeshore Grille serves upscale American fare in an inviting rustic-chic ambience. Amenities include a business center, fitness center, Internet, laundry room, ATM, and numerous on-site activities and educational programs by the Iowa Department of Natural Resources. 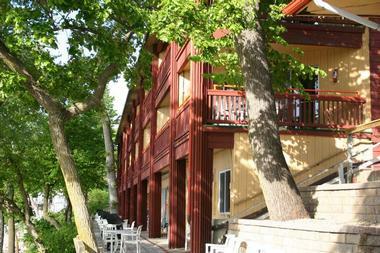 Red Cedar Lodge sits along the picturesque Cedar River two miles outside Charles City, Iowa. 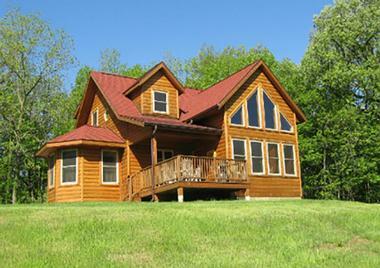 The lodge consists of three log cabin-style vacation rentals set apart from each other enough for solitude and privacy. Each spacious home features an expansive deck with gas grill, fully stocked kitchen, gas fireplace, 37-inch HDTV with cable, Wi-Fi, pillow-top beds with plush bedding, and a campfire ring in the yard. 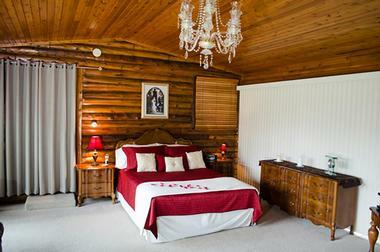 Eagle’s Nest accommodates up to eight guests. Moonlight Bend and Sunrise Ridge accommodate up to 10 guests. Canoe and kayak self-guided tours of Cedar River are available to guests, and include shuttle van drop-off and pick-up. 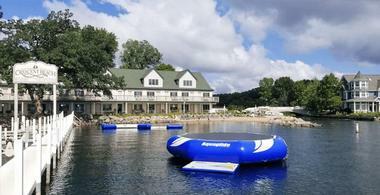 Visitors to popular West Lake Okoboji in northwest Iowa will find Fillenwarth Beach Resort in Arnolds Park, Iowa. The lakeside resort boasts four adjacent properties. Main Beach just north of the iconic Arnolds Park Amusement Park. Chateau-style suites have private decks, gas grills, kitchenettes, full baths, lake views, and a shared lakeside deck. North Beach is two blocks from Main Beach, and offers lakeside cabins, cabanas, studios, cottages, chalets, and duplexes. South Beach has spectacular lakefront views, and shared dock, tennis court, and patio. Cottage Colony has 25 cottages and three treetop apartments. Fillenwarth complimentary activities include themed cruises, water skiing, sailing, paddle boats, canoes, row boats, outdoor and indoor pools, recreation program, game room, beach, docks, and epic sunsets. Grand Harbor Resort and Waterpark is situated along the mighty Mississippi River in Dubuque, Iowa. This luxury, family-friendly hotel has 193 well-appointed rooms and suites with modern furnishings, plush bedding, and a sophisticated, neutral décor. Room amenities include separate seating areas, free Wi-Fi, 32-inch flat-screen TVs, marble bathrooms with granite countertops and Terra Green spa products, and scenic views of the city bluffs, the historic downtown, or the impressive Mississippi River. Hotel amenities include complimentary Wi-Fi throughout, daily newspaper, free airport shuttle, business center, fitness center, and Tony Roma Restaurant. Use of the resort’s exclusive indoor waterpark has an added resort fee. Arrowwood Resort & Conference Center is a luxury vacation resort located in Okoboji, Iowa, the state’s premier vacation hot spot. Situated on a stunning 27-hole golf course managed by Brooks National Golf Club, it’s the perfect escape. Accommodations come in four styles – King rooms, Double Queen rooms, King Executive Suites, and Double Room Whirlpool Suites. Room amenities include free Wi-Fi, flat-screen TV, mini-fridge, microwave, complimentary coffee station, desk, and armchair with ottoman. Suites also have sleeper sofas and separate seating areas. Guests will enjoy dining at award-winning Minervas Restaurant & Bar, a local favorite. Other hotel amenities include a salon, fashion boutique, golf course, and Indoor Water Playland. 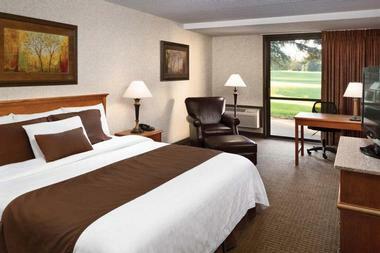 Riverside Casino & Golf Resort in Riverside, Iowa, provides the perfect overnight, weekend, or weeklong getaway. This luxury resort offers guests luxurious accommodations, revitalizing spa services, world-class golf, Vegas-inspired gaming, top-tier live entertainment, and upscale culinary experiences at five on-site restaurants. Other resort amenities include connected indoor and outdoor pools, hot tub, hair salon, complimentary Wi-Fi and parking, gift shop, and room service. Rooms and suites come in four styles, and amenities include golf course views, 42-inch flat-screen TVs, glass enclosed showers, refrigerators, coffeemakers, and pillow-top beds with luxurious bedding. Other room amenities are air conditioning, pay-per-view movies, satellite TV channels, iPod compatible alarm clock, and free Wi-Fi. 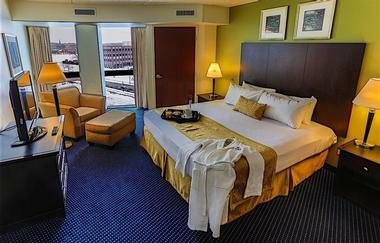 Des Lux Hotel is centrally located in downtown Des Moines, Iowa, within walking distance to The Principal Riverwalk, Pappajohn Sculpture Park, and exciting dining options like 801 Chophouse and MALO. Des Lux offers guests nine room and suite options from the Presidential Suite with Atrium to the King Executive. Room amenities include luxurious bed, lounge chair with ottoman, work desk, refrigerator, coffeemaker, flat-screen TV with cable, honor bar, and umbrella. 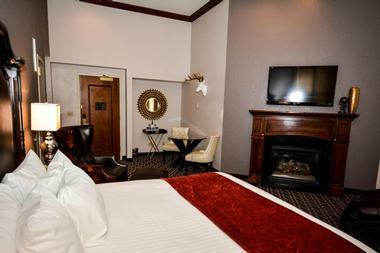 Every room and suite also comes with complimentary full breakfast and free high-speed Wi-Fi. Many have fireplaces and/or whirlpools. Hotel amenities include the gorgeous wood-paneled Des Lux Bar with weekday happy hours, hotel shuttle service to and from Des Moines International Airport, and a 24-hour fitness center with showers, steam room, and whirlpool. Bridges Bay Resort is a modern lakefront resort on East Lake Okoboji in Arnolds Park, Iowa. It offers visitors both waterfront hotel rooms and waterfront vacation rental condos. Hotel rooms have a mini-fridge, 32-inch flat-screen TV, private patio or deck, two armchairs, table, coffeemaker, and en-suite. One-, two-, and three-bedroom condo suites add fully stocked full kitchen, dining table and chairs for six, electric fireplace, and an extra TV in the bedroom. All accommodations come with Boji Splash Waterpark passes. Waters Edge American Grille is the resort’s upscale steak and seafood restaurant, and there are three other casual restaurants on the property. Resort amenities include a fitness center, boat hoist rentals, an arcade, and a fishing pond. As its name implies, Quiet Walker Lodge is just that – a quiet getaway. This beautiful, award-winning, log cabin-style bed and breakfast is located in Dubuque, Iowa. The main lodge offers five rooms, plus the main dining room, and the separate Wakatanka House has four rooms, plus a solarium and conference room. Rooms and suites are individually designed and room amenities vary. All rooms have a flat-screen TV with satellite, kitchenette, refrigerator, microwave, private shower and bath. Each room or suite has something unique to that room like the Bella Vita room with an in-room waterfall that’s ceiling to floor. B&B amenities include full plated breakfast served in the main lodge, koi pond in the solarium, outdoor fire pit, gardens, and greenhouses. 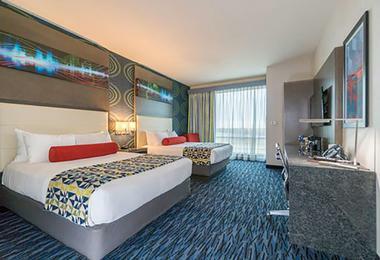 At Rhythm City Casino Resort in Davenport, Iowa, guests can expect sophisticated rooms and suites with modern furnishings and a vibrant color palette. Room amenities at this stylish resort hotel include luxurious beds and bedding, high-speed Internet, MediaCom TV, pay-per-view movies, coffeemaker, refrigerator, room service, and plentiful outlets. Resort amenities include a state-of-the-art casino, live entertainment, fitness center, business center, indoor pool and hot tub, Aveda Salon & Spa, and three restaurants – Ruthie’s Steak & Seafood, Robert’s Buffet, and Draft Day Sports Lounge. The Market offers guests gifts, souvenirs, upscale leisurewear, concert tickets, sunglasses, coffee, pastries, and late night bites to go. 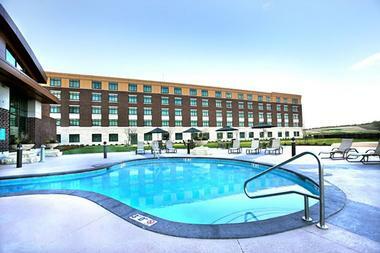 Hotel Blackhawk is a luxury hotel located in Davenport, Iowa, and is part of the Marriott Autograph Collection. This 1915 Davenport landmark hotel has undergone a $46-million renovation. Guests can expect a contemporary and glamorous ambience. Standard rooms are anything but, deluxe rooms have separate sitting areas/rooms, premium rooms have Jacuzzis, and king suites have kitchens for extended stays. All accommodations have luxurious beds and bedding, floor-to-ceiling windows, iPone dock, flat-screen HDTV, bathroom TVs, refrigerator, coffee station, mini-bar, microwave, large work space, and complimentary Wi-Fi. Suites have even more amenities. Hotel amenities include an indoor pool and hot tub, fitness center, bowling alley, spa and salon, barber shop, gift shop, and business center. Meskwaki Casino, located in Tama, Iowa, is a hotel, casino, and RV park. Guests can expect spacious smoking and non-smoking rooms that have flat-screen TVs with cable, refrigerators, in-room coffee stations, and free Wi-Fi. 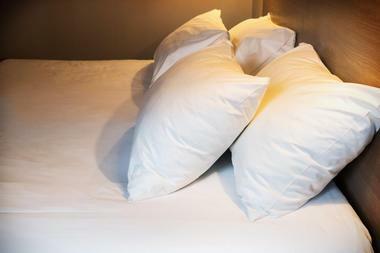 Hotel amenities include a business center, free valet parking, pool, hot tub, fitness center, free shuttle service, lobby/bingo hall shuttle service, and mobility scooter rentals. Winding Stream Spa and Salon is the resort’s full-service spa. Guests can dine at the resort’s signature dining room – Prime Cut Grill, The Buffet, or the Food Arcade, which is like a food court with gaming machines. There’s also Lucky’s Grill & Taproom for drinks and pub-style fare, and The Lounge for drinks and occasional local live music. There is also a concessions stand at the Bingo Hall.